Show your support for your favorite cause with these SwankyTM Awareness Pens! The click-action ballpoint pen with an awarenss clip of your choice is a great thing to pass out to clients or customers. Standard ribbon imprints include awareness pink (breast cancer), patriotic (USA flag), yellow ribbon (vetrans and suicide prevention), and red and aqua blue with multiple causes. 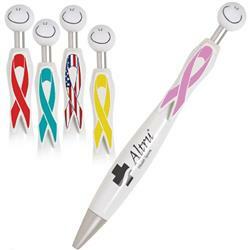 These are great custom awareness pens! Free rush available. Available Colors: White Pen with USA Flag, Pink, Yellow, Aqua Blue and Red. Optional Imprint Method : Four-Color Processwith run charge. Ink Cartridge : Black, medium point. White body pen with awareness ribbons.